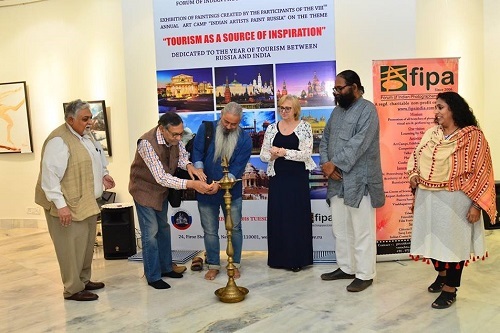 An exhibition of paintings on the theme, ‘Tourism as a Source of Inspiration‘ is on at the Russian Centre of Science and Culture (RCSC), New Delhi, with the intention of promoting the “Year of Tourism between Russia and India – 2018”. Organised by the RCSC jointly with the Forum of Indian Photographers and Artists (FIPA), the exhibition, which opened on 13 November, 2018, showcases paintings created by the participants of the VIIth Annual Art Camp “Indian Artists Paint Russia” on the tourism theme. President of the All-India Fine Arts & Crafts Society (AIFACS) and sculptor of the World’s Tallest Statue “Statue of Unity” of Sardar Vallabbhai Patel, Padma Bhushan ram V Sutir, in his address hailed the activities of the RCSC and FIPA. Chief Guest Advaita Charan Garanayak, Director-General, National Gallery of Modern Art, Ministry of Culture, Government of India, congratulated the artistic talent and sincere efforts of artists, both amateur and professionals, whose paining works have been displayed at the exhibition. He appreciated the initiative and endeavour of the RCSC in promoting art and culture as a unique link in intensifying Indo-Russian relations. Ms. Ludmila Filippova, Chief Coordinator (Culture & Information), RCSC, welcomed the guests. Mr. Vimal Mehta, President of the Federation of Indian Painters’ Assocations (FIPA), in his introductory remarks, made an overall review of the objectives and activities of FIPA in its decade-long existence aimed at encouraging amateur artists and promoting young talents keeping in view the paramount factor of strengthening bilateral relations. He referred to the remarkable response from the public, art-lovers, enthusiasts and media in their earlier annual art camps and painting exhibitions.